6:48 AM Click here to read Part 4 of our series on Anabaptism. Our next (and final) essay will seek to answer the question: Why should a committed Baptist be so interested in considering Anabaptist views? 6:37 AM A student of mine emailed to say that Eisenbrauns is having a big sale on Greek grammars, including A. T. Robertson's Weightlifting 300 textbook. You can check it out at the link below. Thanks for the tip, Jared. In Acts 6 the early church ordained persons to the ministry of "the daily serving of food." For that calling they were very seriously anointed and commissioned, just as were the apostles, who then could focus on their teaching and prayer. I long for the day when our churches will ordain persons to their ministries of janitoring, dishwashing, errand running, lawn mowing, typing, bulletin distribution, and shut-in visiting. 7:07 PM I just read this tragic news about a man who drowned at Kailua Beach while trying to save his son. His boy is in serious condition at a local hospital. Simply heartbreaking. Let's all say a prayer for him. 12:51 PM Need a good laugh? 7:24 AM Speaking of ethos, I think everyone would agree that Ron Paul has it, whether or not one agrees with his political views. With his easygoing, unpretentious manner and undisputed sincerity, Ron Paul comes across as authentic. He's no actor: here, at last, is a man who lives by his principles. Paul refuses to take his generous congressional pension, and disdains all the other perks and privileges of his office. As a doctor, he wouldn't accept Medicaid payments, and forbade his children from taking any federal aid for their education. What you see is definitely what you get. And that's refreshing in and of itself. UPDATE: The Dow Blog weighs in on Ron Paul's views on homeschooling. 7:09 AM The semester begins in two and a half weeks. I'm in the gearing-up mode, for sure. Question: Does technology in the classroom help or hurt? Here's one student's opinion. I agree with many of the points made, not least that PowerPoint is often a complete waste of time. I have yet to see anybody use it very effectively or in a way that the speaker controls the technology and not the other way around. Why do so many seem to use it as a crutch? If you are a dynamic and interesting speaker you can make your Point Powerfully through non-verbal means (continuous eye-contact being a chief one -- put away those silly notes! ), reinforced by your ethos (i.e., credibility, which must be established with your audience from the get-go). One of my education profs at Biola put it this way: "There is no such thing as a boring teacher. If he's boring, he's not a teacher." Of course, he said that before PowerPoint was available. In my own teaching I want to become a good wordsmith, using the English language to the fullest. I have a long way to go, but that's my goal at least. Christ Community is a church where the lost are actively sought, won to Jesus and developed into Christ-like, church planting missionaries. That's a radical idea -- every member a missionary. But maybe not so radical when we read the New Testament! I am so glad to see churches looking outwards to a degree unimaginable 30 years ago. Instead of being a ghetto church, jealously guarding its borders and fearful of the world, CCC is "earthing the Gospel" in a big way. I want you guys to know that I'll be praying for your outreach to the lost in your neighborhoods next month. And thanks for being a church "for others." Love you guys! 8:44 AM In case you're interested, I've just uploaded Part 3 of my series on Anabaptism. My next installment will deal with the topic of peace and war. 6:36 AM Tonight I'm speaking at Christ Community Church in Huntersville, NC. If you live in the greater Charlotte area and would like to stop by and say hi, here's the church's website. The service begins at 5:00 pm. I'll also be speaking in their two Sunday morning services. 6:28 AM Becky has just written a touching essay called Shewalem. 6:23 AM So, what do you do when you miss your horse? You stay focused. You grieve a whole bunch. Sometimes you get a little teary-eyed. It's just not the same around here without Trav. The pasture is empty. EMPTY. So is a huge part of my life. Becky reminded me of the first day she heard me talk about Traveler. We were just about to move to North Carolina. I had found the perfect cross-country horse at a stable in Orange County -- a former race horse, big and strong. Becky says I couldn't stop talking about him. Let's buy him I said. Becky smiled, then nodded. We brought him home, then turned around and trailered him to Oxford along with our Arabian Cody. He really captured my heart, that horse did. He's doing the same for a happy family today. It's therapeutic for me to write these words. I hope you don't mind. Trav was a great companion. Still is. I mustn't forget that. Out of sight maybe, but not out of mind. Never out of mind. 9:34 AM Speaking of my trip, during our boat tour of the Odessa Harbor I sat near a German tourist from Berlin. He was an older man, about 75 I'd guess. We chatted for a long time (in German) about our travels. He told me I needed to see Petra; I told him he needed to visit Hawaii. The discussion eventually turned to politics just about the time we parted company. It then happened that we met again at the airport in Odessa. We chatted briefly, then his last words to me were to this effect: Thank God for you Americans. We will never forget what you did for us during the Berlin airlift. That really touched me. I thanked him profusely for his thanks, and we went our separate ways, two men from different cultures but with a common appreciation of generosity. 7:47 AM I see that Wayne Lehman is continuing to post about the ISV. His comments, as you can see, are valued by the editorial board. 7:20 AM Get thee over to The Assembling of the Church site, where its editor is tackling the meaning of ekklesia, leadership in the church, baptism, and other topics that will appeal to anyone who is willing to rethink the wineskins. 6:55 AM The results are in. My thanks to Mark Goodacre for posting the poll. We left for Ukraine on Tuesday, July 17. We arrived in Odessa (via RDU, JFK, and Budapest) on Wednesday morning. Our team consisted of (from left) Dan Johnson (IMB missionary to Ukraine), Kostya Penner (SEBTS student), Frank Catanzaro (SEBTS counseling professor), me, Scott Powell (SEBTS student), Jack Bowen (DTS student), and Warren Pledger (DTS/SEBTS student). Our flight from JFK to Budapest was completely full, except for a center section of 3 seats. Yours truly was able to spread out and have a long nap on our overnight journey. Upon our arrival in Odessa we took a van to our host city of Nikolayev. We arrived in a country that has been in a severe drought for months. You can see how dry these fields look. I'm told most of Ukraine looks like this: huge fields of wheat, corn, and sunflowers, much of it going to waste. The average temperature while we were there was 105 degrees. I don't think I ever stopped sweating, even at night. This was my first visit to a Russian-speaking part of the world, and I used the opportunity to learn the alphabet and a bit of the grammar. The Cyrillic alphabet is actually a family of alphabets. It has several letters taken from ancient Greek. Can you read this common word at intersections? Our team taught each day, Thursday to Saturday, in two venues. In the mornings we traveled to Kherson, a major city about an hour's drive from Nikolayev. Below is the Baptist Church. We met in its sanctuary and taught various subjects ranging from the doctrine of salvation to basic homiletics. Sergei, my fantastic translator, is a recent graduate of Odessa Theological Seminary, where he will begin teaching this fall. He holds a copy of the Russian translation of my book Using New Testament Greek in Ministry. My lectures were based on chapter 3: how to move from text to sermon. Our audience was comprised of pastors and Sunday School teachers. Head coverings among the women are a common sight in Baptist churches in Ukraine. Kostya originally hailed from Russian-speaking Kazakhstan and was able to give his lectures in that language. He is also fluent in German, having moved to the city of Worms with his family when he was 12. He was a great help to me with my Russian. Kostya was really in his natural element on this trip, and it showed. The Baptist Church of God's Grace was our host venue in Nikolayev. It is the mother church of the region, which has a total of 55 Baptist congregations. Here are the church's spiritual leaders, to whom we presented ties as gifts. In the center is Brother Victor, who shepherds the mother church. We stayed in Victor's home while in Nikolayev. I took this shot just before I preached in the Sunday morning service at the Church of God's Grace. As you can see, the meetings are wonderfully age-integrated. I knew the Ukrainians were famous for their church music, but it was a blessing to experience it up close and personal. At the end of the service guess what took place? A wedding! It was so fascinating to me that I'll give you a more detailed report later. Then, on Sunday evening I witnessed baptism candidates being interviewed by the church and then voted on. Again, the process was so interesting that I think it deserves a lengthier report. On Monday we traipsed off to a local church to help with their summer children's program. The sign reads: "Christian Church, Reconciliation of God." Sergei and Warren led the games while I drew portraits of as many non-Christian children as we could round up, telling them how much Jesus loves them. Here Scott speaks to the youth and children. His translator was Sasha, a bright young man who studied English at the university. On our last day in Ukraine I met up with a former student of mine from Simon Greenleaf University in Southern California. Alfie Mosse currently teaches at the Odessa Theological Seminary as well as other places in Ukraine. He has been in the country for 4 years and speaks the language fluently. Katya the librarian was delighted to be able to add to her collection my book on adolescence. I was greatly impressed with both the quality and quantity of their library holdings. After getting the grand tour of the seminary and meeting its dean and VP for development, Alfie invited me to have lunch with his family in their apartment. His wife Julie was giving their two daughters some English lessons when we arrived. The children attend public school but are taught English and Bible at home. Anya and Micah are their sweet daughters. Their son was gone, busy translating for some visiting Americans. And he's only 12! The Mosse's are a wonderful family and an exemplary missionary couple: humble, fervent, and able to live simply. I know that SEND International must be very grateful that the Mosse's are on their team. Later in the day we took a brief harbor tour. By then the weather had cooled down to a mere 95 degrees. The catacombs in the city provided shelter for the partisans who resisted the German occupation during World War II. We had an excellent guided tour of their subterranean hideout. The sign below reads: "Here in the catacombs of Nerubaiskoe in the years 1941-42 was located an underground camp of partisan troops, the heroes of the Soviet Union who successfully operated in the midst of enemy troops." The catacombs were originally mined for their sandstone rock. The defenders of Odessa thus has a natural hideout. This sign reads: "Blood for Blood, Death for Death." This was the communications center for a web of tunnels that spread for several miles beneath the city. After our tour we drove to missionary housing built by the IMB in 1997. There we stayed until we left for the airport at 4:30 am. Our final evening together was a de-briefing led by brother Jack. I had nothing but praise for his leadership and organization. 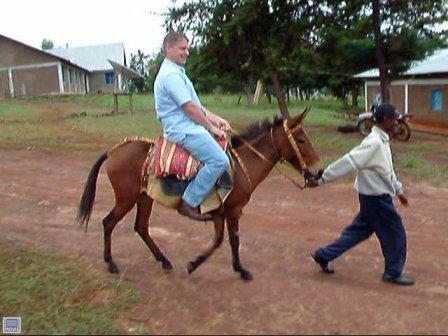 Having done this ourselves only a month ago in Ethiopia, I could identify with the hurdles he had in coordinating the trip. Before I forget, I want you to meet our host family in Nikolayev. From left to right they are Eugene (who is getting married in two weeks at the ripe old age of 20), Danny, Katya, Victor, and Max. They have two other sons not pictured here. Katya and Victor slept outside in their shed to make room for our team. Where the boys slept, I'll never know. What an amazing family. For those of you who enjoy flying, here are a few aerial shots for your viewing pleasure, beginning with this picture of Istanbul, Turkey, where we had a 3-hour layover on the return trip. I won't go into the details, but security in the Istanbul airport was very tight. Almost home -- here's Boston from 35,000 feet. The housing tracts on Long Island seemed to go on forever. I felt like I was back in Los Angeles. What a good feeling, though, when we touched down on home turf. Well, I hope you enjoyed your brief tour of Ukraine. I sense this will not be my only trip to that country. I want to thank our "sky pilot" Jack Bowen who was very efficient in the planning and execution of our mission. More than any other person, he has put Ukraine on my radar screen. Thanks, Jack, for taking your F-16 and 747 skills and applying them to the business of the kingdom. You're my hero. By the way, I forgive you for transferring to Dallas. I know your profs will enjoy having you in class as much as we did in ours. Warmest regards and best wishes for your studies. My next mission trip is in the fall. Trips like these allow me the opportunity to attempt, however feebly, to transmute my understanding of the Bible into concrete service, regardless of national and ethnic boundaries. Whether I am teaching Greek exegesis or facing the complexities of mission life, in either case I seek to "translate the New Testament." Of course, there is really no such thing as "foreign" missions. All countries, including the USA, are mission fields. One of the most important areas of missions is in our churches themselves. The thousands of unconverted members of Baptist churches in America comprise a huge unevangelized opportunity. That's why in my bio I write that Becky and I are missionaries to Mecklenburg County, Virginia, as well as to Ethiopia. Our field is the world. I pray that all of our churches will have so clear an understanding of the action of God's grace in the world that missions will no longer be the hobby of a few but the passion of us all. Let's do our best to ascertain where God is acting in the world and move our resources into the struggle. What say ye? One last item. Your prayers are always appreciated when the Lord leads me on these jaunts. Thanks again. 6:38 PM We just finished our supper: meatloaf, green beans, tomatoes, fried zucchini, and fresh corn. It occurred to me that everything on my plate was grown on our farm. I don't say this proudly. I'm constantly amazed at the goodness of the Lord to us -- far more than we could ever deserve. Becky and her girl friend are getting caught up on the front porch so I think I'll work on my Ukraine report. I took a lot of pictures, so hold on to your hats! 5:10 PM Potpourri: Tonight we're having one of Becky's closest friends over for supper. She's cooking up a storm.... Nate's helping out at a Christian camp so I'll be bottle feeding the calves tonight.... I'm typing up my latest essay on the Anabaptists. Actually got a lot of writing done on this trip by taking advantage of layovers and long plane rides.... Just got a nice phone call from my friend Voddie Baucham in Houston. Says his latest book is out:Family Driven Faith. You can check it out here. (Don't forget to send me my copy, man.).... Hope to have my Ukraine report up tomorrow. I think you'll like it. God is doing some amazing things there. 4:50 PM Becky saved for me while I was gone a great article that appeared in the July 22 edition of the Raleigh News & Observer about a trunk of letters that belonged to Mary Custis Lee. It's a phenomenal find: 4,000 letters, photographs, and documents, all belonging to the eldest daughter of Robert E. Lee. (Lee's nickname for her was simply "Daughter." She never married.) There's a bill from a hotel in Milan, a letter from novelist Henry James, and several letters from her father. The Virginia Historical Society has just made the papers available for public viewing. Count me in. 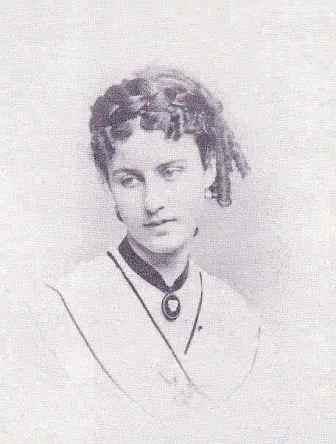 By the way, the article concludes with a great quote: "My understanding is that Mary Custis Lee was a rather formidable person. You didn't want to mess with her." 8:52 AM Good morning! We're back on the farm. Just picked okra and shucked corn. Becky's in the kitchen canning vegetables. Life is good. I had a wonderful time in Ukraine and a marvelous reception at the airport last night. Got to sleep around 2:00 am. Funny, all night I dreamt in Russian. Will give you a full report you on the trip as soon as I answer emails. Meanwhile, thanks for your thoughts and prayers. Great to be home. 7:23 AM Yesterday I was told we'll be teaching rural pastors during our trip to Ukraine, which begins today. Most of them are farmers with hardly any education. They are bi-vocational. But they are dedicated. Wow. My kind of people exactly. Can you see my Anabaptistic sentiments coming out? The Reformers in Switzerland and the Netherlands denied Anabaptists the right to be called a church because their pastors were not chosen according to "proper church order." How did the Anabaptists respond? By rejecting out of hand the arguments that sacramental ordination, apostolic succession, or education are necessary for functioning as a pastor. Only a man who lives an upright life and has been taught by the Holy Spirit can be considered as a pastor. And that was not all. Only those pastors who had been chosen by a local congregation that was equally obedient to the Word of God had unquestioned legitimacy. Now that's powerful, don't you think? Now do you know why I love my Anabaptist forebears so much? I think I'll love these Baptist pastors just as much. We're off to the airport. To all of my cyberbuddies, may God bless you real good. I look forward to reading your blogs when I get back on the 26th. Meanwhile, let's all continue to present our bodies as living sacrifices to Him and use everything we are and everything we have so that lost souls in spiritual darkness may hear of Jesus and His love and power to save, keep, and satisfy. I love you! 7:10 AM I met with yet another student yesterday who is contemplating doctoral studies. Of course, I always encourage young people to consider a European doctorate, and one from a university. All other things being equal (which they never are), a university doctorate is more rigorous than a seminary one. I well remember going to the University of Basel and thinking, "This can't be happening. Graduates of a non-descript seminary like Talbot don't go to a prestigious university for their doctor's degree." Why did I choose Basel? Two reasons. First, it was a "liberal" university (in the purest sense of the word). The professors there were open-minded. There was no automatic bias against conservative evangelicals. As long as you wrote an acceptable dissertation and had it published, they granted you your degree (after you delivered 125 copies to the university library). Basel has always been known for welcoming people of various theological perspectives. 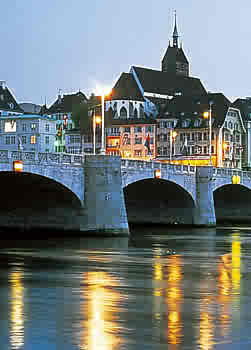 The function of Basel as a city of refuge in the 1500s is well-known. Through the influence of Erasmus we find there Curione, Castellio (who was unwelcome in Geneva), Cellarius, Hans Denck (who died there), Karlstadt, and David Joris (the "Anabaptist flamingo"). Oecolampadius arrived there in 1522, and in the same year Erich Hugwald, a professor at the University of Basel, wrote a book against infant baptism. I arrived there in 1980 and have never regretted it. The other reason I went to Basel (rather than Tübingen, where I had also been accepted) was a man named Bo Reicke, my doctor father who to me embodied the perfect balance between humanitas and pietas. Again, I was not disappointed. Professor Reicke was the perfect mentor. So if you are thinking about doing a doctorate I would encourage you to put all the options on the table and then let the Lord narrow your choices. I wouldn't put God in a box in any way, shape, or form. Dream high. And then let Jesus direct your steps. 7:00 AM Great news! Trav arrived safe and sound yesterday at his new home near Rocky Mount, VA. He'll be in good company. The family has 8 other horses. Thanks to all who have written to me, sharing words of sympathy and comfort. It meant a lot, believe me. I'm not ashamed to say that I love my animals, even my chickens and ducks. Each one is a very special gift from God. 7:10 AM Today I say goodbye to a longtime friend and companion. Thank you for the pleasure and companionship you've given me. I loved you well. I shall never forget you. 7:05 AM The latest addition to our home page is Part 2 of our series on the Anabaptists. 7:00 AM Visiting the nursing home in Clarksville is always the highlight of my week. I would rather sing for these people than almost anything else in this old world of ours. Previously I introduced you to brother Franklin. He recently lost his roommate of 10 years. Yesterday he was in great pain, and they had to take him to the hospital. It's his heart, the nurses say. I share this photo with you with his permission. He requests your prayers. He's got mine. I love you, Frankie. See you soon. 6:45 AM Yesterday I received this incredible email from a Christian brother named Stephen Orr. It brought me to tears. Tears of grief over my loss, and tears of thanksgiving and amazement that a complete stranger would take the time to write me a letter so full of empathy and consolation. Stephen has allowed me to share it with you. Read it and be blessed. Greetings in the Name of Him Who said to the leper, "I will; be thou clean." After my prayers this morning, I checked your blog and read that tomorrow is the day when you will be saying good-bye to Traveler. I have met many Christians in my lifetime who seem to sneer at (or at least ignore) the affection one can have for an animal. This dismissive attitude troubles me. As I have told people in the past, such an attitude stands in contrast to the convicting parable about the rich man and the poor man which Nathan spoke to David. When Nathan described the loving relationship of the poor man to his little ewe lamb, David did not react with derision or confusion at such a relationship; rather, he grew very angry because of the rich man's harsh destruction of the relationship. And I may be very far off the mark here, but I have noticed that in Revelation 5:13, we see a scene in which every type of creature in heaven and earth is gathered around the throne. I like to think that we will see beloved pets and animal companions there in that pure and sinless environment. All this to say that I empathize deeply with the farewell you face tomorrow. I know that you have reminded yourself many times that what you are doing is a kindness to faithful old Traveler, that his being in a place where he can be ridden and exercised regularly will be a good and loving thing for him. But do not discount your own grief (and that is what it is, brother) at having to say good-bye to a faithful companion. Grieve, and then dry your eyes and worship the God Who gave Traveler to you for a short season. My late father-in-law was, in his younger years, one of the top breeders of Arabian horses in the USA. During his last few years of life, he kept one horse on five acres. 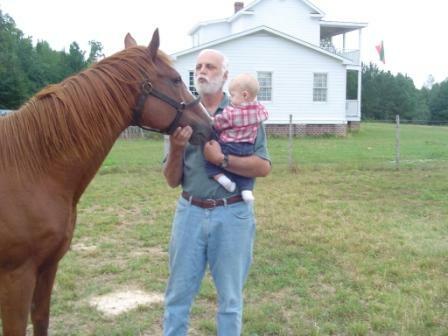 I used to go and have a cup of coffee with him, passing sweet, silent hours by sitting on his front porch and watching the horse, Copper, as he cropped grass in front of the house. PawPaw's affection for and devotion to old Copper was as palpable as his love for his Savior. Thinking of PawPaw and Copper together always makes me smile...and cry just a bit. 6:56 AM Today and tomorrow are going to be very emotional days for me. This morning I speak at my home church about Ethiopia. And tomorrow Traveler is being picked up. How do you compress into a 30-minute talk all your thoughts and feelings about the people you love so deeply? And how do you say goodbye to an animal you've ridden hundreds of times, who heeds your every beck and call, who nudges you with his nuzzle every time you greet him in the pasture, with whom you have bonded over 9 wonderful years? I'm glad we're singing at the nursing home this morning. It will help me get my thoughts off myself and onto others, where they belong. On a more cheerful note: I have been invited to visit a very unreached area of the world to train pastors and to meet with some Muslim leaders. For security reasons, all I can tell you here is that the trip will be in the fall. I'll have a few more details for those of you who are on our email prayer list. Needless to say I am very excited about this unique opportunity. Please pray (1) that a visa will be issued and (2) for wisdom to know what to say and do. Missions is where it's at, Amen? 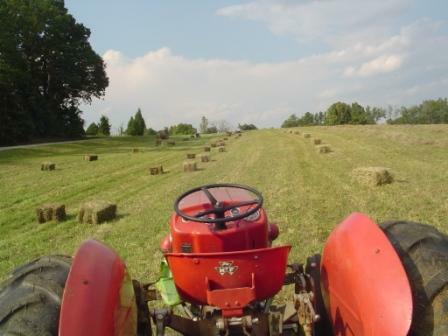 6:43 PM There are 3 ways you can buy hay from us: pick it up in the field yourself (cheapest), pick it up from our barn (cheaper), or have us deliver it (still cheap but we charge a delivery fee). Nate just took off with this load of 60 square bales to a farm about 15 minutes south of us. Once he's unloaded he'll proceed to a horse ranch in Oxford and swap out our trailers, bringing home a trailer load of horse manure. How Nathan concocted that deal I'll never know, but it provides us with several thousand dollars' worth of free fertilizer each year. That's a deal you just can't get at Southern States. 5:28 PM Last call! For suggestions, that is. As many of you know, I am currently preparing a third edition of my beginning grammar, Learn to Read New Testament Greek. I plan to have my editing work done by Nov. 1. Several of my readers have used or taught from the book, and I wanted you to know that any constructive criticism you send me will be greatly appreciated and will be turned to the improvement of the book. And here's some great news: The next edition will be accompanied by a hefty workbook! It has been produced and field tested by the New Testament faculty of a sister seminary here in Virginia. I think it will make the perfect supplement for anyone using our grammar. So let me know where I have missed the mark or where I have obscured the simple or where my discussion is too wordy (or brief) or any other weaknesses you see (and I'm sure there are many I am blind to). I have already taken an Amazon.com reviewer's criticisms to heart and have added beside each vocabulary word in the index the page in the grammar where that word is introduced. That was a superb suggestion. Any others? We need to realize again that the Great Commission is the mission of the church. Going further, the Great Commission is not just a corporate thing the church does though its programs but through real people's lives. We need to "go into the world" again instead of just inviting people to come to church to hear the Good News. We have compartmentalized our lives so well that, as Christians, we see it as something separate. Instead, I believe we need to reintegrate our faith into every aspect of our lives which would consequently have us share our faith with those around us. Wow! I'm glad I stumbled onto this site. 5:15 PM Is it time you had a vacation for the soul? 5:05 PM Becky's essay (below) talked about our agricultural work in Alaba. Is food aid the solution? Not according to this study. 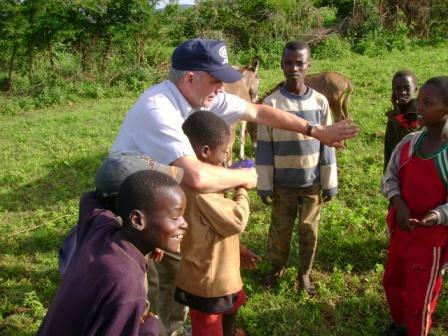 The author concludes that "food aid is not yielding the intended result of food security. Despite its positive contributions in times of emergency, food aid and other interventions are creating dependency, weakening farmers’ capacities for innovative farming, disrupting the prices of other food resources, and changing the marketplace for indigenous foods." Good stuff, this. 9:54 AM Churches today have to make a choice to follow contemporary patterns of ecclesiology or use the early church as a model, as did the Dissenters of the sixteenth century. Although they shared many theological concepts with the Protestant Reformers, the Dissenters parted company on several crucial points including the separation of church and state (the church must reject all ties with princes and magistrate), believers' baptism (the church consists solely of voluntary members), and restoration rather than reformation (the only valid model of church life is the early church as revealed in the New Testament). Because of these beliefs the Dissenters endured fierce repression. What sustained them was the reality of Christian community. They truly loved and cared for each other. Like the earliest Christians, they wanted to be known above all by their love, Christian works, and mutual support. Heinrich Bullinger, Zwingli's successor in Zurich, criticized the Swiss Brethren for teaching that "every Christian is under duty before God to use from motives of love all his possessions to supply the necessities of life to any of his brethren." At the very heart of the dissenting churches was the practice of Christian love and community expressed in material support and concern for outsiders. So genuine and important was the reality of community that the severest penalty was exclusion from the fellowship. During their gatherings great care was taken that all things were done decently and in order and that all the members had an opportunity to exercise their gifts for the edification of all. Congregations were small enough so that all the members knew each other and could offer any assistance that was necessary. Balthasar Hubmeier wrote in 1526: "For we are not lords of our possessions, but stewards and distributors. There is certainly no one who says that another's goods may be seized and made common; rather, he would gladly give the coat in addition to the shirt." The Anabaptists believed they were required by God to care for their poor members, the ill, widows, and orphans, and that one congregation was to minister to the needs of the other. For example, the toleration enjoyed by the Mennonites in the Netherlands enabled them to use their prosperity to help their persecuted brethren in Switzerland. Now that's "Body Life"! Like the Anabaptists of the sixteenth century, who longed for a restoration both in the structures and the practices of the church and whose vision differed from the magisterial model, so I believe it is time for an alternative vision of church and society, one that is Christocentric and follows the pattern of Jesus by obedience to His teaching and His example. More than anything we need a return to the pure Word of God as the only guide to Christian conduct and thought. A classic case in point: today we find congregational participation in our gatherings squelched by an unbiblical emphasis on the "clergy" and a corresponding passivity among the "laypeople." The motivation behind limiting congregational participation is undoubtedly noble (to ensure "quality," to protect against heresies, to maintain order, etc.). Still, such motivations seem biblically unsustainable. For example, quality can be just as low in a church that practices monological preaching as in one that encourages mutual participation. Besides, the worst heresies in the Christian church have not been promulgated by laypeople but rather by professionally trained theologians. Finally, only a form of corporate ministry in which all believers are free to exercise their gifts and share their insights would seem to comport with the New Testament. Along with Romans 12, Ephesians 4, and 1 Peter 4, 1 Corinthians 14 teaches that the church is a Body comprised of many members, each of which has something important to contribute to the whole. Apparently Paul believed that God may speak or act through any member of the church for the benefit of the entire community. The result must have been a richness and diversity scarcely known today in many of our churches. Not that every member ministry entails either the participation of all believers in every gathering or the abolishing of leadership. Rather, it involves a wide participation by those who are Spirit-led. A communal approach to ministry would seem, then, to be a core value of the church and should be encouraged by the leadership, whose role is more facilitative than dominant. Common dangers must be recognized and avoided (e.g., over-participation by some, fear of being criticized by the group, passivity). When it is felt that the conventional monologue is appropriate, it will be helpful to stop for questions and interaction with one's hearers, if not in the middle then at least at the end. Jesus' own teaching was frequently characterized by verbal interaction, while the apostle Paul clearly engaged in dialogue with his Christian audiences (dialegomai). Even the famous Christian orator Chysostom interrupted his discourses frequently to ask questions in order to make sure he was understood. Every believer is a priest, and although congregations certainly benefit from the theological expertise of some, the New Testament knows no cult of the expert who ignores the gifts of the people. Yet another attractive teaching of the Anabaptists ("attractive" because it is biblical) was their belief that the Great Commission was the responsibility of every believer and could not be left to pastors or mission agencies. Jesus Himself calls us to a life of service and witness. Call this "missional" if you like, but it is clearly a scriptural concept. God's mission agenda is at the very heart of a New Testament church, not the "Sunday event." There is so much I believe we can and must learn from the Dissenters: not only their theology of involvement, not only their belief in the priesthood of all believers, but many other core values as well. In the coming weeks I hope to offer a brief series of essays on what I have learned and am learning from the Anabaptists. My interests lie particularly in the area of the New Testament and the ways in which the New Testament offers us a picture of the church as it was meant to function. I do not seek the reformation of the church nor its renewal. I pray that God may restore the true church on biblical and especially Christological foundations. Your prayers are greatly appreciated. Hyperlink: What I Have Learned from the Anabaptists (Part 1). It was like the works of a clock where every cogwheel drives another, and everything turns in an orderly way, or like a hive of bees where all work together, some making wax, some making honey and some carrying nectar to the hive. 7:52 AM Becky continues our Ethiopian vignettes with an essay called Is Your Knee Bent? Isn't God good? Right now Becky is cooking one of my all-time favorite meals: cow liver layered with Vidalia onions and a side of mashed potatoes. Am I blessed or what? 7:40 AM Over at the New Testament Gateway Weblog Mark Goodacre has posted a poll that asks: "What is your preferred introductory Greek grammar?" I'm honored that Mark included our grammar in his list. You can vote here. 7:32 AM Three or four of you have asked recently for special prayer. I want you to know that I am happy to oblige. Your names have been entered into my daily prayer list. Prayer is acknowledging the suffering and misery of the world and God's sufficiency to deal with it. This is exactly how Christ prayed: "In his anguish he prayed even more earnestly, and his sweat fell to the ground like great drops of blood" (Luke 22:44, JB). I want you to know that I deeply empathize with you and am interceding on your behalf. One thing is certain: Without the Christ-given gift of courage, none of us could endure life's crushing blows. I commend each of you to God's grace -- His overflowing, infinitely wise love, never deserved and never repayable. 7:24 AM Speaking of Boydton, the town was famous for its horse races in years gone by. I too have been a rabid horse lover for many years but have recently given up riding because I simply no longer have the time or energy to ride such a high-strung animal (and hard riding is the only kind I like). I just found a wonderful home for my spirited thoroughbred Traveler, a place where he will be ridden regularly and be well-cared for. This has been a real answer to prayer for me. Trav has been a wonderful friend. It will be sad to see him go, but I know it's the right thing to do. 7:17 AM What a great day we had yesterday. First, I want to thank Bob and Sudie Early for letting us get the tin off their tobacco barns. They have a beautiful farm. It's in a small community called Baskerville, though I didn't see Sir Henry. On the way home we drove through our county seat, Boydton, named after the Boyd family and featuring many historic sites. Then we finished our porch job at a neighbor's farm. When I got home I was so tired I plopped into bed and promptly fell asleep. Almost missed supper too, but the delicious smell of Becky's chicken fettuccini was enough to raise the dead. Today? Putting tin on the barn roof, and probably scavenging some more tin from our next door neighbor's barns. Nate's worked out a great deal with him. Hope your summer crops are doing well. Ours are going gangbusters, and the recent rain was a Godsend, believe me. In case you're interested, here are a few pix of yesterday's activities. Here's one of the two barns we worked on. I say "we," meaning, of course, Nathan, who is definitely not afraid of heights. Most of this tin is siding quality, but some of it is in good enough shape to use on our barn roof. Nathan is very discerning about his building materials. If you recognize Sudie that's because she was on our Alaba Team in Ethiopia last month. She edits the photos in their church's newsletter, which we really enjoy reading. Across the street from their farm was an old graveyard. This marker especially stood out to me. Thomas Bowers was in Company A of the Third Virginia Cavalry. I bet that young man could ride. No site in the "big city" of Boydton (pop. 454) is more worth a visit than Boyd's Tavern, where Mr. Bowers and other young men mustered into the Confederate Army at the start of the war. (Another young soldier named Anderson Boyd also passed muster here. Mr. Boyd was a corporal in the 59th Virginia Infantry Regiment. He was the owner of my farm and is buried in our cemetery.) The tavern has been completely restored to its former grandeur. If you're ever in Southside Virginia you simply must stop in Boydton and visit this famous inn. The Boydton Courthouse predates the Civil War. Like most county seats in Virginia, it features a prominent statue in honor of those who fought and died in the War of 1861. I've never desired to be a college president, but if I did here's where I would want to live. The president of Randolph-Macon College lived in this two-storied gable roofed home. Today the house lies vacant and is falling into disrepair. One of my dreams is to buy an old house like this one and restore it. Randolph-Macon College was the oldest chartered Methodist college in the United States. After the Civil War war, the school was moved to Ashland, VA. Here's all that's left of the college. Just look at these window moldings. I have never seen more beautiful woodwork, except for the crown moldings here in Bradford Hall that Nathan crafted for us. Finally, here's the porch that Nate and I rebuilt. I thoroughly enjoyed working with Nate on this project, even though I'm a card-carrying member of the Unskilled Workers of America. I hope I didn't bore you too much with these stories and photos. I guess it's just the writer and artist in me coming out. 8:28 AM This morning I'm eager to start working on the barn, but first I want to thank all of the team members who traveled with Becky and me to Ethiopia last month. I benefited from your company in countless ways and will always value your friendship. Pastor Jason E. led the charge at Bethel Hill. Jason is actually a Ph.D. student at the seminary but he didn't let that get in his way. In many ways he made the Burji team what it was -- a superbly knit group of highly talented individuals. The joke on our trip when we needed a boost was, "Where's Mary?" Thank you, Miss Mary, for a smile that lights up every room you're in and for the unbelievable work you did with the children of Soyama. Not bad for someone who's 80-years young. Then there's Sheree -- passionate, committed, with a tremendous affection for the Ethiopians (she was actually born in Shashamanee). She worked hard on her women's classes and it showed. Ed's a great friend, an amazing repository of knowledge about computers, and a very enjoyable person to be around. He job was not easy -- teaching computer skills to leaders in the Burji District -- but he's proud that all of his students passed the course with flying colors. Way to go, Ed. Danny -- wry, soft-spoken, but my hero. He had an amazing ability to get things working, even those silly kites. I enjoyed watching you and the children with the Frisbees, Danny -- with your thick North Carolina accent! 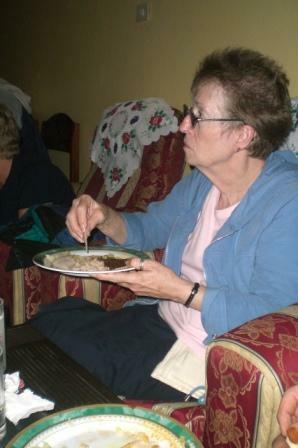 Cindi took great care of her mother-in-law Mary, but she was more than a caregiver. She's one of the most optimistic people I've ever met and smart as a whip to boot. Thanks for coming on this trip Cindi and for taking such good care of all of us through your praying and caring. Your classes were a big hit. Jason H. and Stacey, what can I say? I loved watching the grace of God at work in your life as a couple. Clearly Christ is the center of your marriage. Your commitment to Him is amazing. I'm really glad you both came. Carolyn from Tabernacle brought a maturity and sense of experience to an otherwise green and excitable group (she's been on innumerable mission trips). The old saying indicts us: "If you were arrested for being a Christian, would there be enough evidence to convict you?" Carolyn, there would be more than enough with you! Sudie, you were an invaluable photo-journalist on the Alaba team. I'll always cherish the way you offered unswerving help to Carolyn in her English classes. Maybe you'll teach one next time. Pastor Earnie did a great job with the book of Romans and gave a fantastic prayer at the graduation service in Alaba. Thanks, brother, for setting a great example for the rest of your people at Union Chapel. Gunda, you were more than just Ernie's better half. It was a joy having you with us. I hope the bell choir idea sticks! Lloyd has traveled the globe on mission trips, mostly doing construction. He was a real inspiration, and it was great having him work with Becky in the villages teaching farmers about crops, soil conservation, and the love of Jesus. And Becky? Amazingly organized, effective, and smart. We couldn't have done any of this without you, honey. Thank you, from all of us. This Sunday Becky will be at Tabernacle Baptist Church to hear Carolyn and Sudie's report to the church. I'll be speaking on Ethiopia at our home church, Averett. Bethel Hill and Union Chapel are still planning their presentations. 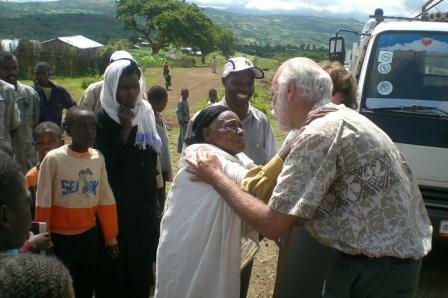 Many more stories of God's work in Ethiopia can and must be told. In the days to come we'll continue to post vignettes about our trip, but I didn't want to wait any longer to express my gratitude to God for my teammates. God bless all of you. 7:57 AM The latest addition to our home page is called Handicapped? Serve the Lord Anyway! The Catholic catechism makes it very clear that you are born again and justified through baptism. That means faith plus a certain rite — which is administered by the church — is necessary for salvation. So, the church essentially grants salvation. Although this salvation is “by faith,” additional grace enables us “to work” to attain eternal life. And that’s the problem with saying we speak the same gospel. One of them is clear: Christ did it; we can’t add anything to that. The other one is: Christ did it, but to actually avail yourself of what Christ did you have to do this and this. It is a humiliating time when evangelicals should be red faced with shame for compromising the basic Gospel message. Thank you, Bob, for your unashamedly orthodox (and unpopular) stance. 1) Voddie Baucham defends his SBC education resolution. Don’t miss his peroration. To read the resolution go here (.pdf). And for a slightly different take on homeschooling, go here. 2) Dan Edelen offers some noteworthy book thoughts. Don’t miss what he says about Dan Allender’s Leading With a Limp. 3) The director of the Greene County, Missouri Constitution Party explains the party’s main focus. Don’t miss what he says about the 25 powers granted to Congress by the Constitution. 4) Tom Engelhardt explains why civilian deaths in Iraq are “advertant.” Don’t miss what he says about barbarism. There is a legitimate place for patriotic sentiments in the Christian life. The relationship between Christian commitment and political citizenship is subject to considerable confusion. Much preaching on this subject is downright silly, full of shallow sentimentality and naive interpretations of such passages as the “render unto Caesar” saying and Romans 13. This is certainly inexcusable in the Reformed/Presbyterian tradition, where John Calvin and John Knox and Abraham Kuyper and Allan Boesak and other Calvinists have provided us with such a rich store of Christian reflection on the basic issues of civic life. Reformed theological wisdom is desperately needed on such matters today, given the heresies that are so prominent in popular political piety. How, for example, can Christians who believe that only Christ’s sacrifice can truly atone for sin refer to deaths of soldiers who have died in the service of their country—however courageous their actions—as “the supreme sacrifice”? Patriotic songs also contain many dangerous teachings. 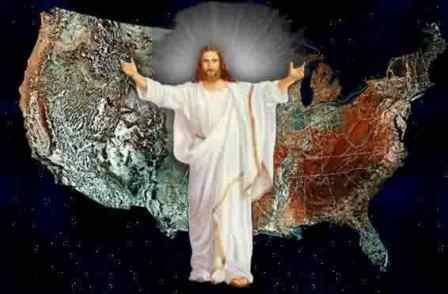 Take, for example, the “eschatological” verse of “America the Beautiful.” Themes that in the book of Revelation are used to describe the Holy City are here applied to the United States: “alabaster cities,” “undimmed by human tears,” the “shining sea.” As if the United States will become the promised New Jerusalem! And yet Reformed Christians—even the kind who sometimes boast of their commitment to “sound theology”—often sing these words without a thought to the heresies they are mouthing. This is not mere nit-picking. Given the sinfulness of the human condition, idolatry is a very real threat. Political life has certainly not been immune to the general dangers of forming idolatrous allegiances. And when nations and governments have exceeded their God-ordained boundaries by asking citizens for their ultimate loyalties, they have often borrowed the language of religion. The Roman emperors demanded that they be addressed as “Lord.” And Hitler deceived the German people into thinking that they were a “holy nation,” and a “chosen race.” We must be very diligent in warning the people of God against applying the themes of Zion to the nations in whose midst we are called to serve our only true and righteous Sovereign. You can read the entire essay here. It will be well worth your effort. 7:23 AM Chuck Baldwin decries the socialist state America is fast becoming – a bureaucratic nightmare of Kafkaesque proportions. 7:17 AM My good friend Alvin Reid has published yet another great book challenging young adults to become radical followers of Jesus. It’s called Join the Movement. Alvin has several other publications to his credit (though I’m sure he would give all the credit to the Lord Jesus). Buy his books, and feed his children. 4:45 PM Over at LRC, Walter Block asks, “Can Ron Paul Win?” His answer? Yes and no. My opinion? Not as long as Mr. Paul refuses to play the Jesus Card. H. L. Mencken once observed that religion “is used as a club and a cloak by politicians and moralists, all of them lusting for power and most of them palpably friends.” As long as Paul refuses to pander to the base he’s got no chance as a GOP candidate. The elite old boy network, which is far more unilateral, ideological, and belligerent than Paul could ever be, will see to it. The one factor he’s got going for him? From the very beginning he refused to believe the casuistry belli. That has got to count for something among true conservatives, hasn’t it? The one thing I like most about Ron Paul is that he does not provide new answers to old questions, but rather, like Wittgenstein, he changes the questions. I believe the American public is just beginning to appreciate the significance of how Paul is teaching us to think constitutionally again. 7:27 AM The latest addition to our home page is called The Constitution or Caesar? In the New Testament church one sees vigor and activity; one sees a living community, conscious of its glory and of its responsibility, with the whole church, as it were, an evangelistic force. The notion of people belonging to the church in order to come to sit down and fold their arms and listen, with just two or three doing everything, is quite foreign to the New Testament, and it seems to me it is foreign to what has always been the characteristic of the church in times of revival and of reawakening. 5:11 PM We just spent 3 hours at the nursing home. We sang, shared in the Lord's Supper, sang some more, took the elements to the bedridden, sang some more, then kept on singing until we were hoarse. All the old hymns of the faith, and some good old-fashioned country Gospel songs thrown in as well. We got "joyful," as they say. Nate's been asked to go back on Tuesday morning and I'll go with him if I can. Next Sunday morning we'll be back again for their 8:30 am service. This time Nathan will bring the gut bucket. Now that will be a "sang." What a blessing! Right now I'm cooking Chinese for supper (yes, with my secret ingredient), and this evening we'll pig out on Doritos chips and salsa -- for some reason I always get this craving when I've been in Africa. 1:40 PM Nathan's message this morning was a blessing. He spoke from Matthew and John about two men who rejected Jesus, Judas and Peter, and how each reacted differently to their sin. The one was overcome with guilt, the other with genuine remorse. I like Nathan's style: down-to-earth and homely. And he sticks with the text. Not bad for a humble farm boy. Right now we're off to sing at the local nursing home and to serve communion. 1:36 PM In case you didn't know, Ethiopia will be celebrating the new millennium come September 11, which begins the year 2000. Here's a piece that celebrates this event. Warning: it's a big gushy, but you can't blame the author, who's an ex-pat living in New York. And, if you like Ethiopian coffee (and who doesn't? ), here's a blog that specializes in coffee -- the politics of growing and selling it, that is. At certain hours the moat was open to all prisoners who wanted to use it for exercise. Descent to the moat was from the castle itself and one did not go past the guards, so there was no check on the number of prisoners going up or coming down. While the moat was open to prisoners there was also the usual small party in the gymnasium. It would not be difficult for a prisoner, sitting on the outside wall of the moat by the gym, to fix the grappling iron and surreptitiously lower the rope down to the bottom of the moat. Now, why am I mentioning this? To illustrate the power of the Internet. I have never been to Spangenberg Castle, not in person at least. But by going to this site I can take a virtual tour of the castle: its massive main gate, the twin keeps, even the moat itself. It's almost as good as being there, and makes the little story I'm reading come alive. Currently we are looking into another tremendous feature of the Internet: Skype. And it seems we are just at the beginning of the cybernetic revolution. And that's very good news. 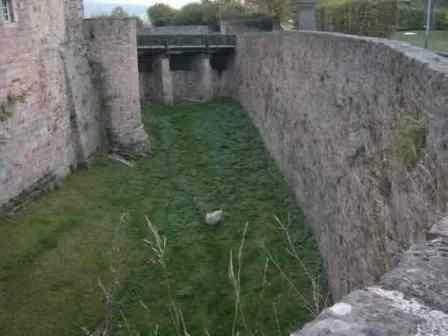 Below: The castle moat. Calnan never got a chance to escape from Spangenberg. He was moved to another camp the day before his planned escape attempt. 7:33 AM This missionary to Ethiopia thinks that God's work must be done through the local church. He's right, of course. 7:20 AM Latin seems to be making a big comeback in Roman Catholic circles. Call it mass appeal, if you like. My wish: That more and more Protestants would take up the language. Especially if you want to study theology. Or read Barth. Or acquire the basis for learning a modern Romance language. Or graduate from the University of Basel (you will have to swear your doctoral oath in Latin). Here's a good place to begin your studies. 1) Good news! We just completed nailing the tin siding on the back of the new hay barn. Next project: finish the roofing tin. I'm thinking I might want to have an official dedication service once the thing is complete. I'll especially invite the mayor and dogcatcher of Opie, VA, to come (inside joke). I think they might appreciate the sophisticated architectural design. 2) Tomorrow I'm attending Gravel Hill Baptist Church. I'm going there especially to hear their guest speaker. Who might that be? Only the young man I work with on the farm on a daily basis. 3) Now get this. One of our broods of newly hatched chicks has two mamas. That's right. Two. They both "cluck, cluck," and the little ones all come a-runnin. The mamas seem to get along just fine together, too. I've never seen such a strange sight before. 12:10 PM "65 years ago today, Eugene Oppeneer and Verna Augustine said 'I do!' Little did they know where those words of commitment would lead them." Thus begins aheartwarming essay that every married couple should read. 11:51 AM Once again, Alan Knox has an excellent blog entry on the topic of community. I believe we can draw many insights about community from the so-called Third World nations. In recent years Christianity has experienced a significant movement to the Southern Hemisphere. The center of gravity for the worldwide Christian movement is now Africa, Latin America, and Asia. Missiologists speak of this as the Third Church, the church of the third millennium. It is my personal conviction that the most significant Spirit-directed movements in the global church of the twenty-first century will come from the Third Church, in which community is central. One example: the thousands of Filipino women who work as maids in the rich oil-producing countries of the Middle East, where Islam is the official religion and where western missionaries are not allowed. In the midst of their daily chores these nannies sing Christian songs and tell Bible stories to the children in their care. They view themselves as missionaries in a foreign country, Missiologists call this "missions from below." It is simply believers living out their Christian lives in the daily routines of life. These missionaries have no power, no prestige, no money, they are not part of a missionary "organization," but they are radical about Jesus. I am seeing this kind of radical Christianity in more and more American churches that Becky and I visit. Yes, they support annual missions offerings (as well they should). 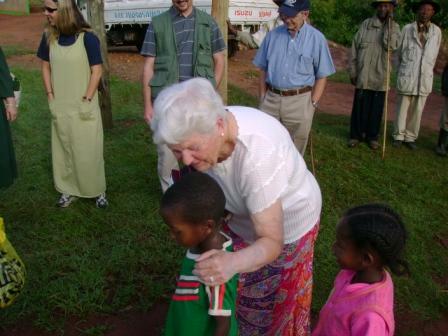 But they also seek to relate church-to-church and person-to-person with the work of God's kingdom globally. They are becoming less interested in the ABCs of the church ("ABC" being an acronym for attendance, buildings, and cash -- see Mr. Knox's entry here) and more interested in reprioritizing their resources to get the maximum bang for the buck. Missions, for them, is getting the job done "from below." They are realizing that there is only one method for mission work: God uses people filled with the Holy Spirit. Period. It is a great pleasure for me to be associated with these lifestyle missionaries, for whom the Bible is truly authoritative, not the methods of men. Alan Knox is just one of a whole cadre that the Lord Jesus is raising up. My question: Are you ready to join the revolution? 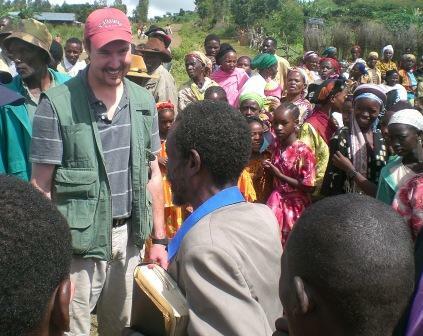 Below: Practically the whole community of Kulicho in Burji turns out to welcome "from below" missionaries Danny and Jason from Bethel Hill Baptist Church in Roxboro, NC. Danny, by the way, works in a power plant. Jason is a used-car salesman. Both see themselves in full-time Christian service. Kura was loved so much God sent His Son, and then some 2000 years latter God sent you as His ambassador! I long for more divine appointments (or maybe an awareness to them), and I only can hope I am surrendered enough to handle them (or spirit filled enough to see them). Thanks for being such great examples. Instantaneous communication. I for one am exceedingly thankful for it. When I was young I spent hundreds of hours looking across the bonnet of one of those very same tractors. It was there that I preached the greatest sermons never heard, and appreciated the great gift of living on the land. Kindred spirits, we, in so many ways. I have never met this special friend. Somehow I need to find a way to visit the Great Down Under, methinks. 8:49 AM As promised, today we begin offering a series of brief vignettes of our last trip to Ethiopia. Becky starts it off with a poignant story of a blind boy in Burji. His name? Kura. 7:06 PM Allow me to introduce to you Team Ukraine. Our fearless leader is none other than Jack Bowen who, when he's not piloting a 747 to Beijing or Frankfurt, is studying Greek and other subjects in seminary. Jack has a huge desire to train a new generation of leaders in Ukraine and had led several trips there before. My four fellow team members and their subjects are: Frank Catanzaro (Biblical Counseling), Konstantin Penner (Homiletics), Warren Pledger (the Biblical Covenants), and Scott Powell (Basic Theology). Yours truly has been asked to teach "How to Study the Bible." This will be my first mission trip with Frank Catanzaro, aka "Captain Zorro," who offices next door to me on campus and is an all around great guy. When he isn't teaching he's offering free counseling in his office to hundreds of students each year. Our students in Ukraine will be pastors will no formal theological training at all. Most if not all are bi-vocational (ah, men after my own heart) and (I am told) passionately in love with Jesus. I am also told that they are eager for us to come and teach. According to the book Operation World (p. 552), the great need in Ukraine today is for "good, spiritual, theological training.... Virtually no pastors in evangelical churches have had any training at all; preaching quality amply demonstrates the lack." I am very excited to be going with this team. The Lord Jesus has ordained it that we will not walk in faith or in warfare alone. We walk and work with friends to accomplish His will. I thank God for each one of them. 6:53 PM Today Nate and I replaced a neighbor's front porch posts and railings. Took us 5 hours. I am always happy to help Nathan with his jobs. It would take him a lot longer to get anything done without his "able" (cough, cough) assistant. I, of course, enjoy the outdoor work and the exercise. It's also fun to help Nathan make a few bucks. Tomorrow he promises me we'll work on our new hay barn, now that we've scavenged more tin. I am eager to see that project completed. 11:58 AM Peter over at Young Anabaptist Radicals has some good suggestions about cost-savings when it comes to annual church conventions. Food for thought, for sure. Mennonites meeting in San Jose makes about as much sense to me as Baptists meeting in Las Vegas. Unless, of course, you just have to "pull the lever once" in your lifetime (as one pastor's wife confessed to me). 9:48 AM While reading my second favorite book of the New Testament this morning I saw this statement: "[God] has not left himself without a witness by doing good, by giving you rain from heaven and fruitful seasons, and by filling you with food and joyful hearts" (Acts 14:17). Last night we got some much needed rain. It wasn't much, but it was rain, and for that I am deeply grateful to the rain-giving God. Yesterday Becky put up 21 quarts of squash and we're also getting cucumbers, tomatoes, okra and corn. All of this because of the grace of the Lord Jesus. How a farmer can be an atheist is beyond me. 9:41 AM Yesterday while taking a break from our brick work I dozed off briefly and had a dream that I was back in Hawaii, surfing at famous Pupukea Beach. I had just taken off on a 20 foot wave when the lip of the wave hit me squarely on my neck, practically decapitating me. I was so startled I woke up only to remember that this actually did happen to me one day while surfing at the North Shore. Afterwards I was told my wipe out was a huge crowd pleaser. As for me, I had a huge headache and called it a day. I find it funny that my subconscious so often takes me back to my surfing days, when I was a radical Jesus Freak (and radical about most everything else too). It was at that time that the Lord gave me a strong desire to study His Word, so off I went to the nearest Bible school to Hawaii -- Biola College in La Mirada, CA. -- where I met the love of my life and began my teaching career. My passion for waves began gradually to turn into a passion for languages, and today I have practically no desire to return to my old hobby. It's all so very odd yet understandable at the same time. Am I the only one who gets so nostalgic about his past? 9:33 AM There's no better time to begin blogging than now. Here's why. 7:50 PM A big Thursday shout-out to Steve Sensenig of Theological Musings for mentioning our latest essay at his site. Steve, I am honored that a man as busy as you are should have taken the time to read let alone link to DBO. I am profoundly grateful to God that we met in person on two occasions, and I look forward to seeing you again should the Lord Jesus allow our paths to cross in the future. You are appreciated! 6:05 PM Look at what I've been up to: fixing a chimney. Actually, Nathan did all the skilled labor. I mixed the mortar, passed up the bricks and flue liners, picked up the discarded bricks, etc. The chimney had been struck by lightning so Nate was hired to fix it. It was a big job, too -- took us 5 hours. I see another storm is on its way, and well I should hope. It has been dry here of late, not quite drought conditions but mighty close. As I write Nathan is on his way to a dairy farm near Oxford to buy us two more baby calves. That means it's back to bottle feeding for the next month. Becky is in the kitchen cooking up a storm (Mexican, I think). I'm going to get cleaned up and rest before supper. Such is life in rural Virginia. 12:37 PM Geoffrey Bromily wants to ask Karl Barth a few questions. I suppose we all would. Note: By the time I got to Basel, Karl Barth had already retired though I did take a few courses with his son Markus. I sometimes wonder whether the academic milieu of a European university doesn't encourage the kind of speculative thinking raised in the link above. That is, there seems to be a tendency to question the status quo, to pursue novel tangents, and to delve into speculation at the cost of the exegesis of specific texts, but when it comes to truly believing what one is writing there's a disconnect. One example: During a course on Mark with Markus Barth we were treated to a lengthy excursus on the unscriptural premise behind paedo-baptism, that it was totally unbiblical, etc. At the end of the semester, a student asked a very practical question: "Dr. Barth, when I become a pastor and I am asked to baptism someone's infant, what should I do?" 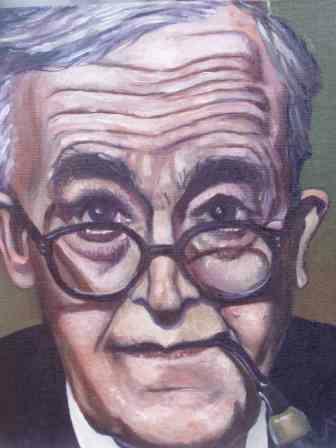 Barth's answer was to say, in effect, go ahead and do it; don't lose your job over something as unimportant as that. Am I being too critical of Dr. Barth? Probably; I shudder to think how often in my own teaching there has been a disconnect between what I understand the Bible to teach and my own practices, especially in terms of ecclesiology. That said, I do read Karl Barth's Dogmatics every chance I get, if for no other reason than to see how he handles the Greek text (which is usually impeccably). 12:15 PM Matthew McDill (one of my Ph.D. students in New Testament) has begun blogging on the topic of birth control. Stay tuned for some mighty good posts. 11:39 AM With humbleness of heart and gratitude toward God, I want to thank all of you who have prayed for us during our mission trips to Ethiopia. In 1927 Roland Allen coined the term “the spontaneous expansion of the church.” God has allowed Becky and me to experience first-hand the realities of this expansion during our journeys. We work in what missiologists call the “Third Church” – the First Church being the Eastern Church of the first millennium, and the Second Church being the Western Church of the second millennium. The Third Church is the church of the new millennium, the church of the Southern Hemisphere. It is here that the center of gravity of global missions has shifted. With the decline of Christianity in the West, this shift will only become more perceptible in the years ahead. Below is a brief summary of our mission philosophy. Please keep in mind that we are not professionals. 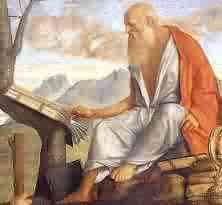 We have sought to derive our mission philosophy as much as possible from the Book of Books. Of course, we are not infallible. Only God’s Word is. Yet we believe these principles are scriptural. They drive our missionary efforts. First, we believe that no human book can teach us missions. We prefer to look instead to the writings of the New Testament itself as authoritative in a way that no man-produced book is authoritative. We seek to learn from Jesus, Paul, and the apostles not only why we should do missionary work but also how. We believe that both the mandate and the model for missions must be patterned after the example of Jesus Christ. 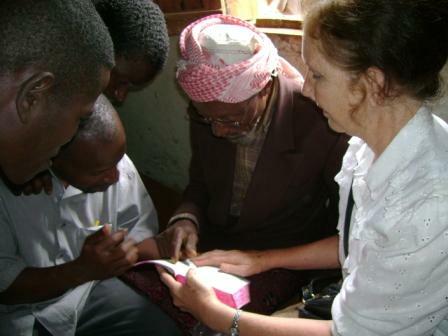 Thus we seek to do missions Christ’s way – “as the Father has sent Me, so I am sending you.” In short, our desire as missionaries is simply to follow the Scriptures, which stress the power of the Holy Spirit in the life of the church – not organizations, methods, programs, or personalities. As a result, we seek to avoid the cult of personality or the emphasis today upon methods and programs. “This is the way the New Testament church did it” is for us more than a slogan. We have a deep conviction that the one essential for missions is prayer and sensitivity to the leading of the Holy Spirit. We see ourselves involved in a faith-commitment that cannot be explained by merely human factors. We therefore seek to do missions “from below,” depending solely on the leadership of the Holy Spirit and seeking to work with other believers who are open to His prompting. Our efforts are not the result of large, well-financed organizations but the work of simple, everyday Christians who understand that the Christian mission today is the responsibility of the global church. We endeavor always to follow Jesus’ model and to practice humble dependence on the Holy Spirit. Secondly, we have intentionally adopted a cooperative model of missions. We will gladly work with any Christ-centered evangelical church that is willing to answer Christ’s call to obedience and self-sacrificing love. We don’t have to see eye-to-eye on secondary issues to work hand-in-hand. John Newton, author of “Amazing Grace,” once wrote to a fellow pastor: “What will it profit a man if he gains his cause, and silences his adversaries, if at the same time he loses that humble, tender flame of the Spirit in which the Lord delights, and to which the promise of his presence is made?” We believe that the whole Body of Christ can and must submit itself to its Head, the great Redeemer of mankind. This is the very heart of Christianity – disciples of Jesus following Him in obedience and love. In Him we are all one family in which each member is given a grace gift, a functional service to carry out for the good of all. We are all brothers in Christ, members of one spiritual family, parts of one spiritual Body. However, love must be balanced by biblical knowledge and discernment, as Paul reminds us (Phil. 1:9). We therefore reject teaching that emphasizes prosperity and well-being as concomitants of the Gospel. We also reject the spirit of lovelessness and strife that characterizes theological fundamentalism. We eschew the “church marketing” concept and the professionalizing of “the ministry.” We seek to avoid the pitfalls of missionary paternalism. For us, a lump in the throat is no excuse for a hole in the head. Thirdly and finally, we are committed to evangelizing primarily where missionaries are not actively working. Thus far the Lord Jesus has appointed us to work in the regions of Burji and Alaba mainly because little mission effort exists in those places. Like Joseph in Egypt, Daniel in Babylon, and Nehemiah in Persia, we seek to become a blessing to the people of these tribes. 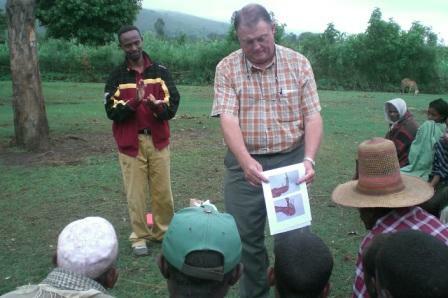 Currently we are exploring opportunities to serve the Lord in northern Ethiopia. We sense that this may be precisely the right time in history to launch a new thrust (Gal. 4:4). 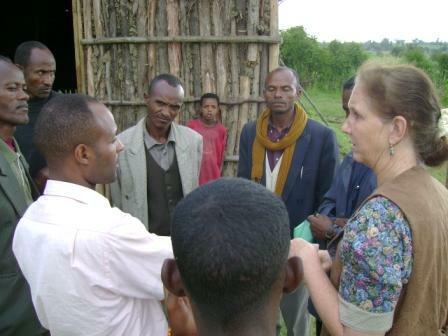 We believe that the various evangelical churches in Gonder can be the source of new missionary efforts in the North Gonder Region, which is largely Orthodox. In most woredas (provinces) there are only three or four believers and no established churches. Our approach to evangelism among the Muslims of the south and the Orthodox of the north will always be to incorporate personal Christian discipleship with the constraining love of Christ. So there you have it – our philosophy of missions in a nutshell: the Bible our textbook, the Spirit our Guide, and the neediest our harvest field. The Lord has commissioned Becky and me to be in the “Gospel business,” even though we are not professionals. 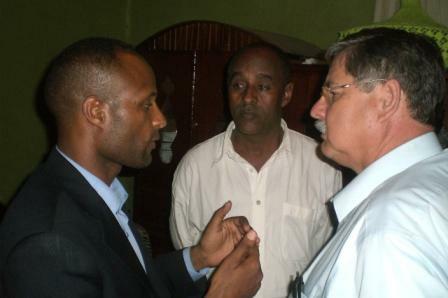 He has blessed us more than we could ever deserve with the honor of representing Him in the darkest areas of Ethiopia. On our last trip we learned so much from the example of the believers. We went to serve them, but from the first day it was we who were served. We sought to lift their spirits, but it was we who were uplifted. In making us feel so welcome, so cared for, they were the hands of Christ on our behalf. Little wonder we love them so much! If the Lord Jesus should lay Ethiopia on your hearts, we would love to partner with you in the work. Because Becky and I are completely self-supporting, every penny that is sent to us goes to meet the needs of the churches and evangelists in Ethiopia. May God bless you for your desire to see the Good News brought to the lost of Africa. Below: This is one of my favorite pictures that I took during this last trip. 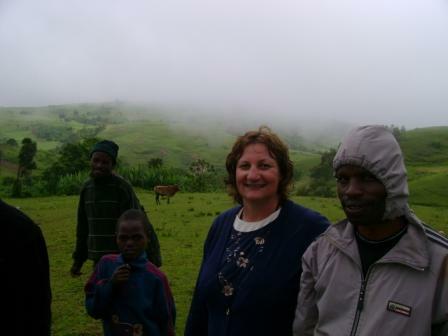 Becky stands next to one of the oldest believers in Burji. Age is still respected in Ethiopia, and this gentleman is practically revered for his wisdom. In larger assemblies he would often be called upon to pray. It's at times like that that I sorely wish I could understand Amharic. What's more, the man is a former student of my father-in-law, Tex Lapsley, who with his own hands built the very first school in Burji. And so the good work goes on, from generation to generation. 7:01 PM What a great fourth it's been. Becky worked at the hospital (for Ethiopia) while Nate and I worked on farm projects. I spoke about our community below. And it really is one. It seems the Lord moved us to rural Mecklenburg County at just the right time. The old timers are tearing down their old barns, and Nate and I are in constant need of roofing tin and side boards. What a symbiosis. A neighbor offered us the tin and wood from this old barn. As usual, Nathan did all the hard work, while I was the gofer (and official farm photographer, of course). And here it is. Our new barn. Is it beginning to look like one yet? And guess what hatched out today? And these aren't half of them. O yes, we also got up 125 more bales this afternoon, thank the Lord. We are both bone tired. All the same, it's been a great day, and I heard from many of you via email today. Thanks for taking the time to write. You are truly the greatest readers a writer could ask for. Meanwhile, it's time to dig into the beef ribs Becky put in the crock pot for us. Talk at you tomorrow. 8:48 AM While we were gone our duck population increased 10-fold. Ain't they sweet? 8:37 AM A week ago we were saying our goodbyes to our Ethiopian loved ones, including our adopted children. Here David and I share a cup of macchiato before leaving Alaba. David was formerly called Ahmed but wanted a Christian name and took mine. Is it hard to leave them behind? This picture speaks for itself. What can do I now? What I always do: pray for them daily, by name. They are loved. 8:10 AM Alan Knox reminds us that just as a butterfly is not a fly made out of butter and a pineapple is not an apple that grows on a pine tree, so the Greek word ekklesia ("church") does not refer to a "called out" group of Christians. This fallacy, long ago exposed by James Barr and many others (including Don Carson), is called the root fallacy or etymologizing. The meaning of a Greek word is always determined by its usage and never by its morphology alone, though sometimes the two combine, as inekballo ("I throw out"), from ek ("out") and ballo ("I throw"). We who teach or preach need to be especially careful lest we transmit the wrong ideas to our people when we do word studies. How, then, should ekklesia be translated into English? Of the many glosses that have been offered ("congregation," "assembly," "church") by far my favorite is "community," for that is exactly what the term refers to. A German equivalent might be Gemeinde, a word that can be used in a purely secular way (like the Greek ekklesia) or in a religious sense. Thus, while driving in Germany I might see a sign welcoming me to the "Gemeinde Lörrach" (the town of Lörrach), and when I enter the town I might well visit the "Baptistengemeinde Lörrach" -- the Baptist church of Lörrach. Thus, the church that I attend here in southern Virginia might well be called Averett Baptist Community, for that is exactly what it is! One other thought: you can go to church but not belong to a Christian community. In a community there is a deep sense of belonging, of permanency, of mutual care and compassion, of helping each other out, of carrying your own load, of cooperating for the sake of the larger community, of disappointment when a member fails, of joy when a member succeeds, of pain when a member suffers. The worldwide church is just such a community. When a brother in Ethiopia is killed or when believers in Turkey are martyred or when Christians in India are beaten, do I suffer with them? I can and must. Likewise, when my neighbor's crop fails or when my elderly neighbor down the road needs her rain gutters cleaned out or when the local nursing home beckons for a visit it is not someone else's responsibility to meet these needs, it is mine, because this is my community. This is Christianity at its simplest, yet we so easily lose out because we are so busy going to churchrather than living as church in community. I have a responsibility to care for my neighbors (most of whom are believers and many of whom attend Averett), for I am one with them. And even if they are not Christians, I still have an obligation, taking "community" in its broader sense. 6:57 AM The latest addition to our home page is called Cessasionist or Continualist? 6:55 AM Need a good chuckle? Here are the top ten reasons not to live in a parsonage near your church. This is a huge issue in today’s church, and the question remains: Is the Bible driving our “youth ministry,” or is culture? 6:30 AM Stephen Carlson discusses suspended endings and the Gospel of Mark here. So the debate continues. At our recent symposium on the ending of Mark we were treated to several explanations of how the shorter ending might have arisen. In fact, of the four main presenters, two believed the shorter ending was original, and two argued for the longer ending. I am pleased to say that these papers (along with Darrell Bock’s response) have gained the interest of a major US publisher, and I am currently finalizing a book proposal – another thing to check off my to-do list before leaving for Ukraine. 6:23 AM Lee Shelton explains why the neocons are so afraid of Ron Paul. He writes the truth when he observes: “The one, single issue on which Ron Paul and the neocons disagree in principle is the war in Iraq, and for them to admit that Paul might be right when he says that American foreign policy had something to do with people wanting to kill us means giving up the one issue that has kept their side in power for over six years. They are willing to throw every other issue under the bus.” Lee delivers a sharp blow to those who argue that this election is not about the war. Update: Here’s a great interview with Mr. Paul. Go here also (he’s interviewed on the Alan Colmes show). I am the pastor of a small Baptist church in NC. This church has always done the typical 4th of July thing. However, they just cannot get thier preacher to play along. I have done the same thing on all Holidays. (Mother's Day, Father's Day, the 4th, and Memorial Day.) Our choir selects the songs, as they do every Sunday. They recgonize Mother's Father's and Vets Aunts, Uncles whoever and whatever. Then I take the pulpit, I open the Word of God to the passage that comes next, (for the past 6 months I have been preaching throught the Sermon on the Mount) and I expound the Word of God. Mother's Day was Matt. 5:31-32 Adultery , Father's Day was Matt. 5:38-42 The Law of Retaliation and this Sunday will be Matt. 5:48 Be perfect. Some of my people are starting to see what and why I am doing what I do. Because Sunday is the Lord's day no matter what Holiday the world may be celebrating. I don't want to make them change, I want to lead them to change. 6:13 AM I’ve just uploaded to the seminary website an updated syllabus for our Seminar in Greek Linguistics (Ph.D.). The major change is the addition of an oral exam (yes, I said oral) at the end of the semester to test your Greek skills. Also, the 6 required essays are now on reserve in the library, in case you wanted to get a head start on the course. I think you’ll enjoy reading them. 6:10 AM While in Addis we normally stay at the SIM guest house, but since it was booked we stayed at the Addis Kidan guest house instead. Our hosts were Ray and Lauralee Lindholm from Texas. You can read more about the guest house and the Lindholms’ work here andhere. Ray and Lauralee have a huge heart for Ethiopia, and especially for the Orthodox. Becky and I had a long and fruitful discussion with them about our desire to reach out to the Orthodox who live in northern Ethiopia. I’ll have more on that later. 6:02 AM And now a word from your friendly Greek teacher. It’s been 5 weeks since the end of the semester and I’m wondering: Are you sticking with it, or, conversely, it is sticking with you? The tendency of many Greek students is to start off with a burst of enthusiasm that promises much but that eventually cools off until the subject is neglected and finally abandoned. It is rare for me to meet a pastor who has a working knowledge of Greek despite years of study in seminary or Bible College. I wrote Using New Testament Greek in Ministryprecisely to motivate students to use what they worked so hard to acquire. Perhaps that little book will help you jump-start your efforts. However, it is not so much the reading of books but the actual application of our knowledge that will produce the desired results. The only way to maintain your facility in the language is to use it. Reading your Greek New Testament is essential. By means of constant reading, with helps such as interlinears and lexicons if necessary, the Scriptures in Greek will become part and parcel of you. May I therefore encourage you to begin reading your Greek New Testament daily – prayerfully and carefully? Or use a daily devotional guide such as More Light on the Path. Mark in your Bible as you read, and memorize short phrases and clauses. Read, read, and then read some more. This is no easy task, but what costs us nothing in effort is worth exactly that. Take it from this agrarian: The farmer who neglects to plow and sow his fields in the spring will face empty barns in the fall. May God bless each of you in your efforts. 7:42 PM Am I a cessasionist or a continualist? Answer tomorrow. 7:40 PM Just put up 112 bales in the barn. 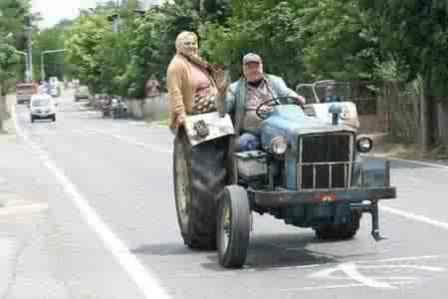 Praise God that our old clunky tractor worked. Praise God that our old clunky baler worked. Praise God that this old clunky 55-year-old worked. Praise God from whom all blessings flow. Tomorrow we'll finish baling the Rabbit Ear fields and work on the barn, Lord willing. Below: one of the sweetest pictures I've ever taken. Man, do I love farming or what. 7:33 PM We welcome back to the farm Miss Sheba who seems to have gotten herself in a bit of a nasty pickle and received a bite on her head by some unidentified creature. Four days in the local animal hospital and a regiment of antibiotics seem to have done the trick. Her wound will need regular swathing with a hot compress for some time, however. Daddy's glad to see you again, Princess. Welcome home. 1) Year-to-date hits at DBO: 2,636,415. And we’re only half way through 2007. Must be the photos. 4) Buddy Hanson of the Christian Policy Network sent me a copy of his latest book called The Christian Prince. Thanks much, friend. 5) The School of Theology of the University of the South in Sewanee, TN, announces a position in New Testament. 6) If you’re thinking about a Ph.D. in New Testament and live in SoCal, here’s a school you might want to consider. 6:57 AM Students: I'm off to my Wake Forest office for a couple of days. If you need to meet with me this would be a good time. My door is always open. 6:55 AM Missionaries are turning out to be bloggers. A helpful list of ex-pat blogs can be foundhere. 6:45 AM Bruce Fisk has some helpful New Testament commentary recommendations. I would have included Markus Barth and Harold Hoehner on Ephesians, but it's not my list. 6:41 AM Here's a very good reason why you should learn to read German. It's a good illustration of how terms such as "Gospel" can be variously interpreted and defined depending on one's language and culture. The tendency of American evangelicalism is to exalt the nation-state over Christ. And the tragic result is that Leviathan, intended to tame human nature, has itself become a predator. This is not to say that disciples of Jesus may not participate in government or in government-sanctioned lethal violence. I have never argued that governments lack legitimate authority to police internally or defend externally. Yet a primary Anabaptist concern is the disavowal of Constantinianism and the recovery of a biblical critique of the state. I confess that I find it extremely distressing that so many Christians give the state their blind, unqualified allegiance. That is nothing less than idolatry. Anabaptist history reminds us that the maintenance of religious liberty is a duty of the state. It also reminds us that Christianity can never be advanced by means of an alliance with the state. This means that the church, as a transcendent institution, should reject any alignment with political power and should seek to ensure that the state remains properly secular. I think the Anabaptists were right about many things, not least about what the church is or ought to be. I would like to see a major conference held on Anabaptism and the Emerging/Emergent Church sometime, somewhere. Any takers? Update: I once published a review of Scot McKnight's take on the emerging church. If you'd like to read it, click here. 8:26 AM Jim Upchurch asks some good questions about "burger evangelism." My thoughts anon. 8:02 AM Will the new fifth edition of the UBS Greek New Testament introduce any significant changes? I should certainly hope so. It was mind-boggling to me that not a single change in the apparatus was made between the third and fourth editions -- despite all the text-critical essays published by yours truly! Seriously, I do hope the powers that be take into consideration the many challenges to the current consensus opinio that have been published in such journals as Novum Testamentum, New Testament Studies, JBL, etc. Personally, I would at least like to see the footnoted or bracketed readings in Matt. 5:22, John 3:13, andEph. 1:1 carefully reconsidered. And has anybody thought about changing the paragraph titles to reflect advances made in discourse analysis? Obviously, the committee has much work to do. I wish them well. 7:42 AM I leave for Ukraine in exactly 17 days. I am really looking forward to this trip. Again, it will be a team effort, with one of my Greek students heading the charge. I will be traveling with a group of 5 men upon whom God has laid the burden of winning the lost for Christ and edifying His Body, and who are prepared to give everything they have to to the task of fulfilling the Great Commission -- time, money, effort, ability, comfort, prestige. It will be a privilege to be in their company. My task will be to train young Ukrainian pastors in how to study and apply the Bible. Our goal is to take the training to them, rather than having them leave their work and "go" to school. I love that idea. Returning theological education to the local church. It overcomes the three shortcomings of the traditional approach: extraction (we take men out their natural environment), expense (Bible school can be very expensive), and elitism (the graduate acquires the status of a "professional" once he had finished school). I'm not saying that these outcomes are inevitable, but the dangers do exist. I'm also excited that we will be able to use a textbook of mine on exegesis that's been translated into Russian. At any rate, your prayers for our team as we begin our preparations are appreciated. Finally, my deepest worry is always about the demonic pull of politics. I think the devil loves it when we become so entangled in trying to get Caesar to do what we think he should do that we compromise our Kingdom call to do the one thing WE'RE supposed to do; namely, all the things we're trying to get Caesar to do! We can become so entangled with trying to steer politics that we don't get around to simply BEING THE CHURCH. Read the whole post here. One thought of my own: let's be clear about what "the church" is. In my opinion, the Christian mission today is the responsibility of the global church. I'll have more to say about this is a forthcoming entry, but for the church to be the church it must move beyond cultural and linguistic boundaries. This is one reason I was so excited to take with us to Africa a team from the United States. For them, Christ's love is not so much a "love that will not let us go" but a "love that will not let us stay" in ease while souls are perishing. They are simple, everyday Christians "whose hearts God has touched" (1 Sam. 10:26) and upon whom He has laid the burden of global evangelism. No, you don't have to travel a great distance to be a missionary. Just get out of yourself and see people as Jesus saw them -- hurting, helpless, and hopeless. And let them know that the solution is not to be found in politics but in a Person. 7:04 PM Good news: Emails are done. I'm sitting here at the computer dazzled by the awareness of how incredibly connected the world has become. The Internet has brought the Third World church into the heart of North America in a wonderful way. You might be wondering if I enjoyed being away from my computer for a month. The answer is yes and no. I did miss writing and updating my blog, but I also valued the time of fellowship with my American colleagues and my Ethiopian friends. For those of us who enjoy blogging and do it regularly, the Internet can easily turn into a selfish escape into a fictitious global village, all at the cost of real-world relationships. Do not misunderstand me. I have a deep conviction that the Internet is the most powerful tool of communication today, one that is still largely untapped by many evangelicals who could well benefit from it. Where else can one publish an essay and have it read by thousands worldwide instantaneously? I value the new relationships I have established through this means of communication and the spiritual blessing it has been to me and my family. However, the Lord has to remind me constantly that electronic and mechanical technologies can never take the place of real-life conversations, a truth that is forcefully brought home to me whenever I travel outside of the US and leave blogdom behind. 3:08 PM Speaking of my doctoral students, Mel Winstead has just entered the world of cyberspace. You can check out his new blog here. Mel lost his brother Mark recently and has been much in our prayers. I truly enjoyed the WHY FOUR GOSPELS? book. It even helped me understand and appreciate John Orchard's work more, as I had obtained in Romania at the embassy (believe it or not -- from a closed base library somewhere in Germany) a copy of his harmonized Greek text. The more I think about the premise of the four gospels book, the more it seems to fit. If you are right, Peter's public approval of Luke's gospel would have been one of his most important services. 1:31 PM Am working through emails all day today. Thanks for your patience. I will answer you emails in the order in which I received them, beginning with May 30. I'm finally up to June 12! 12:10 PM The latest addition to our home page is called Recovering Paul's Perspective on Pastoral Leadership. 11:06 AM This is fantastic news. I have prayed daily for you, Bobbie, and for your mom and dad. Yes, praise the Lord! 10:58 AM Deinde joins me in commending Gary Long's new book on grammar. Dispensationalism – A form of theological reasoning that divides the history of salvation into several consecutive epochs. In the last of these, the New Testament era, everything else got Left Behind. Books added to make up for the missing 39 (from prior eras) include the Frank Peretti series, and works by Tim La Haye and Hal Lindsey. Apocalyptic interpretations common among such groups show strong influence from the L.A. Times. Early proponents included Marcion and Montanus. There's much good humor at this site and, no, as a dispensationalist I do not take offense. 10:38 AM The world of web-logging continues to grow. Here's a new blog that was birthed while I was in Ethiopia. Kudos, Michael. One suggestion if I may: You might want to reconsider the Greek spelling of your site's title (according to your translation, an omicron, not omega, is required). So, I'm suggesting that the purpose of the meeting of the church (edification) is simple. It does not require sophisticated planning, education, directors, professionals, or scripts. Instead, it requires believers who are indwelled by the Spirit of God and learning from the Spirit from day-to-day following the leading of the Spirit as they meet with other believers. The Spirit himself will take care of the hard work (unity, knowledge, maturity) as we allow ourselves to be used by him. Ethiopia is as elusive as it is addicting, and there is no possible way one can describe its charm – or its challenges. If I have learned one thing from my travels to Ethiopia it is the impenetrableness of its culture. One example: I still struggle with Amharic grammar and vocabulary, even though I have studied its close relative, Hebrew. I can therefore empathize with our newbie teammates from Virginia and North Carolina who were confronted with a totally unfamiliar culture and yet handled every challenge with grace, wit, and – when necessary – bravado. One thing is clear after this, my sixth trip to Ethiopia in three years: by its very nature a visit is utterly indescribable. Never mind the faranji hysteria. What is really impenetrable are the social and religious customs, mores, and taboos. Instead of writing a lengthy report, I will offer both here in my blog and in my Ethiopia Files a series of photo essays – brief vignettes that attempt to capture the sights, sounds, and smells of what we experienced in Ethiopia. I also look forward to linking to the reports from our teammates from Bethel Hill, Tabernacle, and Union Chapel Baptist Churches as soon as these become available. Anyone who has been involved in missions recognizes the shocking level of misery and distress in the great cities of the world. The New Testament reveals that Jesus had compassion for the poor, the marginalized, and the oppressed of society. Ethiopia is a nation of dramatic contrasts. In Addis Ababa, 5 million people guzzle Coke while 60 million Ethiopians struggle to find clean drinking water. The number of street people in the capital continues to grow, the result of family disintegration and mounting poverty. The spiritual needs of the people are no less daunting. I am painfully aware that anything except what Christ works in me is wood, hay, and stubble. I admit that I have struggled against my own lethargy on this trip as much as on any other I have made to Africa, and it was only when I tapped into the energy of One mightier than I that He was able to work. Despite a deep desire to do evangelistic work and to serve the church worldwide, I still find it difficult to forego indulgences and practices that are not in themselves sinful but that hinder the work of God. What’s more, I constantly do battle against my own thorn in the flesh that is intended to drain away my human pride and make me cast myself absolutely on the power of God. For this reason I have often sought solace in Paul’s second letter to the Corinthians. Paul’s natural talents and abilities were more than neutralized by his weaknesses, and yet God was still able to work through him. Paul was strong because he was weak; he set men free because he was in chains; he made men rich because he was poor. These are truths I set forth many years ago in my book Paul, Apostle of Weakness. They have never seemed timelier. In Alaba I taught the book of Philippians, entitling my lessons “The Joy of Sacrifice” and dividing the epistle as follows: “The Evidence of Sacrifice, the Examples of Sacrifice, the Enemies of Sacrifice, and the Expressions of Sacrifice.” I could well have used the title “The Progress of the Gospel” (1:12), for nothing mattered more to Paul than the furtherance of God’s kingdom on earth. The letter’s first imperative confirms this truth (1:27, my paraphrase): “The only thing that really matters in life is that you live as good citizens of heaven in a way that shows how much the Gospel is worth to you.” I venture to say that this, too, is my desire and commitment – to live a life worthy of my calling and fitting to my character as a member of God’s New Society. A big “thank you,” then, to all who prayed for us, and to those who went with us. I trust that you have returned to your homes and churches with a renewed mission consciousness, with a sense that your lives have a purpose in God’s plan for the world. And to all of you: thank you for investing your lives in the proclamation of the Gospel of our Lord Jesus Christ to our world.